Not gonna lie folks, the boat trip from Sorrento to Capri was one of the scariest things I’ve done while on holiday. Although the final destination is one of the most jaw-dropping sights a girl ever did see, the journey itself was a hair-raising experience. While in Sorrento, our hostess at our B&B told us that we could get a boat over to Capri (one of the best and most beautiful sights in Italy) and it would cost around £90 per person. This meant catching a small boat, enough to fit around 10-12 people and took around 45 minutes to get there. The day before we visited Capri from Sorrento, all boats from the island were cancelled owing to strong winds. Obviously this was the best thing to do considering the size of the waves, and the size of the boats ferrying people across. However, on the day we ventured out, the waves were still choppy but not enough to stop us going. Silly me still thought that sitting at the front of the speed boat, shoes off and phone in my hand was a good idea. It was only when zooming over dozens of waves and the boat smacking down on the water that I started to get a little panicky which is unusual for me. Genuinely thought it was going to capsize at one point. Our captain obviously does the trip on a daily basis so I didn’t underestimate his knowledge of the waters. Safe to say, we arrived in one peace to gorgeous island of Capri. Before actually reaching Capri itself, we were taken around the shoreline, visiting the huge rock formations which cover the island. Thankfully the sun was shining hard that day so I was able to get some really amazing pictures. We also got to see inside some of the caves which surround the island. You are driven right up inside the caves, almost touching the walls. Luckily they know how to reverse at the drop of a hat so you don’t get into any trouble while inside. At one point we even saw the famous rock from the Dolce and Gabana advert. You know the one – David Gandy in his little white swimming shorts. Uh, yes. Once turning the final corner, we had made the beach and shoreline. We jumped off the boat with around 5 other people and headed into the nearest cafe for a sandwich and drink which is included in the price of the tour. Afterwards, we were given around 2 and a half hours to wonder off, explore the island and take in the scenery. Thankfully where the boat dropped us off on the beach, there is a mountain bus which takes you to the very top of the island. This is where the magic happens. Once in the centre, it’s as though the entire island quickly transforms into a fashion paradise. There’s designer shops at every turn, and at one point we saw someone doing a professional photoshoot. Probably for Vogue. The island is a place of luxury and oozes elegance, upscale hotels and shopping, from designer fashions to limoncello and handmade leather sandals. Needless to say I felt a little underdressed in my Primark dress but who cares. More importantly, the views are stunning, there’s really nothing else like it that I’ve seen before. Naturally, we took to parading around the island looking for ice cream and shade. The sky only had the odd scatter of cloud that day which make all my pictures look 100x better which I’m happy about. Around every corner is another high-end designer store and another beautiful restaurant that you could only ever afford to dine at on special occasions. It was also lovely to see photographs in the shops of famous people who have visited (Ahem, Beyonce being one of them). If we had longer than a day to explore the island, I would have happily got lost and never returned to the UK, seriously. I’m still considering going back. This is totally what I do every day if I owned my own water taxi. 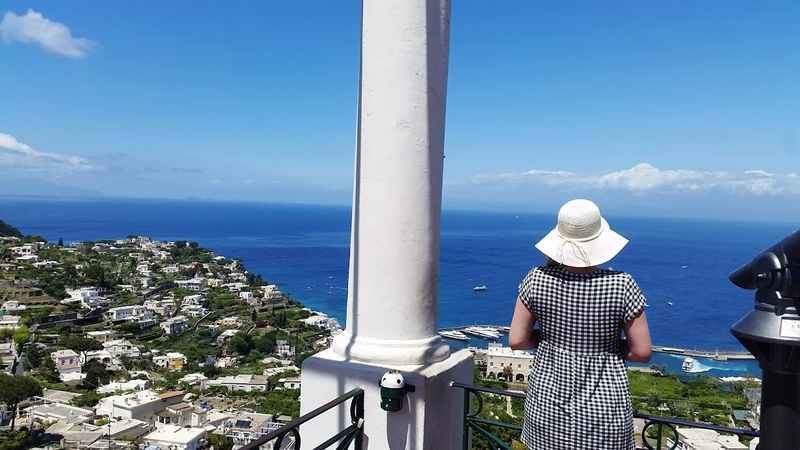 I hope you’ve enjoyed taking a peek into the island of Capri and what we got up to whilst there. I’m so tempted to book a holiday back, because the sights, the food, and the entire experience was pretty much out of this world. Oh, to live a luxury lifestyle, one can only dream. Have you ever visited Capri before or would you consider going?